Despite the depth of the material, almost all of it was approachable with some experience in undergraduate math and computer science. We would strongly recommend both of Michael Mitzenmacher’s talks (1, 2) for an excellent overview of Bloom Filters and Cuckoo hashing that are, in my opinion, significantly better and more in depth than any other out there. Specifically, the Bloom Filter talk presents very elegantly the continuum of Bloom Filter to Counting Bloom Filter to Count-Min Sketch (with “conservative update”) to the Stragglers Problem and Invertible Bloom Filters to, finally, extremely recent work called Odd Sketches. Similarly, Mikkel Thorup’s two talks on hashing (1, 2) do a very thorough job of examining the hows and whys of integer hashing, all the way from the simplest multiply-mod-prime schemes all the way to modern work on tabulation hashing. And if you haven’t heard of tabulation hashing, and specifically twisted tabulation hashing, get on that because (1) it’s amazing that it doesn’t produce trash given how simple it is, (2) it’s unbelievably fast, and (3) it has been proven to provide the guarantees required for almost all of the interesting topics we’ve discussed on the blog in the past: Bloom Filters, Count-Min sketch, HyperLogLog, chaining/linear-probing/cuckoo hash tables, and so on. We really appreciated how much attention Mikkel devoted to practicality of implementation and to empirical performance when discussing hashing algorithms. It warms our heart to hear a leading academic in this field tout the number of nanoseconds it takes to hash an item as vocally as the elegance of the proof behind it! In much the same way, the length of the program really gave us the opportunity to have great conversations with the speakers and attendees between sessions and over dinner. We can’t emphasize this enough: if your ambition to is implement and understand cutting edge algorithms and data structures then the best bang for your buck is to get out there and meet the researchers in person. We’re incredibly lucky to call most of the speakers our friends and to regularly trade notes and get pointers to new research. They have helped us time and again when we’ve been baffled by inconsistent terminology or had a hunch that two pieces of research were “basically saying the same thing”. Unsurprisingly, they are also the best group of people to talk to when it comes to understanding how to foster a culture of successful research. For instance, Mikkel has a great article on how to systematically encourage and reward research article that appears in the March 2013 issue of CACM (pay-wall’d). Also worthwhile is his guest post on Bertrand Meyer’s blog. If Mikkel decides to host another one of these, we cannot recommend attending enough. (Did we mention it was free?!) Thanks again Mikkel, Rasmus, Graham, Alex, Michael, Haim, and John for organizing such a great program and lecturing so eloquently! We’re happy to announce the first open-source release of AK’s PostgreSQL extension for building and manipulating HyperLogLog data structures in SQL, postgresql-hll. We are releasing this code under the Apache License, Version 2.0 which we feel is an excellent balance between permissive usage and liability limitation. What is it and what can I do with it? The extension introduces a new data type, hll, which represents a probabilistic distinct value counter that is a hybrid between a HyperLogLog data structure (for large cardinalities) and a simple set (for small cardinalities). These structures support the basic HLL methods: insert, union, and cardinality, and we’ve also provided aggregate and debugging functions that make using and understanding these things a breeze. We’ve also included a way to do schema versioning of the binary representations of hlls, which should allow a clear path to upgrading the algorithm, as new engineering insights come up. 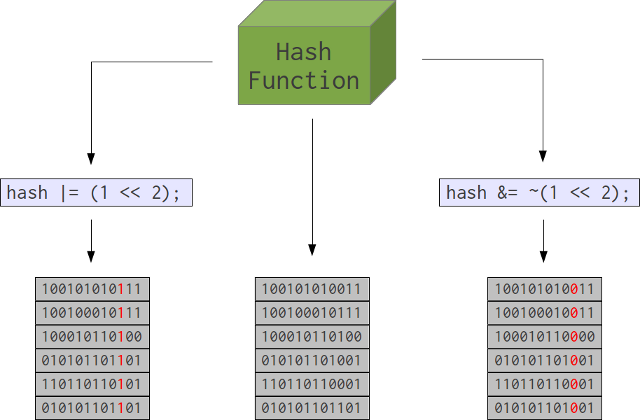 A quick note on why we included MurmurHash3 in the extension: we’ve done a good bit of research on the importance of a good hash function when using sketching algorithms like HyperLogLog and we came to the conclusion that it wouldn’t be very user-friendly to force the user to figure out how to get a good hash function into SQL-land. Sure, there are plenty of cryptographic hash functions available, but those are (computationally) overkill for what is needed. 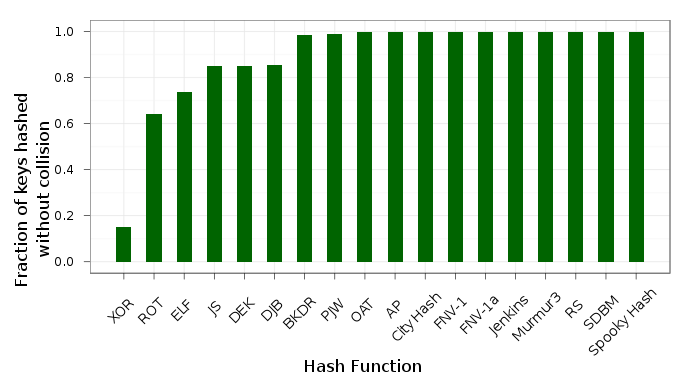 We did the research and found MurmurHash3 to be an excellent non-cryptographic hash function in both theory and practice. We’ve been using it in production for a while now with excellent results. As mentioned in the README, it’s of crucial importance to reliably hash the inputs to hlls. Briefly, # is the cardinality operator which is operating on the hll result of the hll_union_agg aggregate function which unions the previous days’ hlls. We’ve been running this type of code in production for over a year now and are extremely pleased with its performance, ease of use, and expressiveness. Everyone from engineers to researchers to ops people to analysts have been using hlls in their daily reports and queries. We’re seeing product innovation coming from all different directions in the organization as a direct result of having these powerful data structures in an easily accessed and queried format. Dynamic COUNT(DISTINCT ...) queries that would have taken minutes or hours to compute from a fact table or would have been impossible in traditional cube aggregates return in milliseconds. Combine that speed with PostgreSQL’s window and aggregate functions and you have the ability to present interactive, rich distinct-value reporting over huge data sets. I’ll point you to the README and our blog posts on HyperLogLog for more technical details on storage, accuracy, and in-depth use cases. Obviously we’re open-sourcing this for both philanthropic and selfish reasons: we’d love for more people to use this technology so that they can tell us all the neat uses for it that we haven’t thought of yet. In exchange for their insight, we’re promising to stay active in terms of stewardship and contribution of our own improvements. Our primary tool for this will be the GitHub Issues/Pull Request mechanism. We’d considered a mailing list but that seems like overkill right now. If people love postgresql-hll, we’ll figure something out as needed. Please feel free to get in touch with us about the code on GitHub and about the project in general in the comments here. We hope to release additional tools that allow seamless Java application integration with the raw hll data in the future, so stay tuned! Looks Dimitri Fontaine wrote up a basic “how-to” post on using postgresql-hll here and another on unions here. (Thanks, Dimitri!) He brings up the issue that hll_add_agg() returns NULL when aggregating over an empty set when it should probably return an empty hll. Hopefully we’ll have a fix for that soon. You can follow the progress of the issue here. Recalling the KMV algorithm Matt presented in his last post, one will note that every stream element is passed to a hash function as part of the processing step. This is meant to transform the data being operated on from its native distribution into something uniformly distributed. Unfortunately, we don’t live in a perfect world, and since all of the algorithm’s analysis assumes that this hash function does its job well, we wanted to get some sense of how it behaves under less friendly conditions. The first half of this post will investigate the algorithm’s performance when we artificially introduce bias, and the second half will look at its behavior with a handful of real hash functions. The first hash function error model that came to mind is admittedly unrealistic and ham-fisted, but hopefully illustrative. 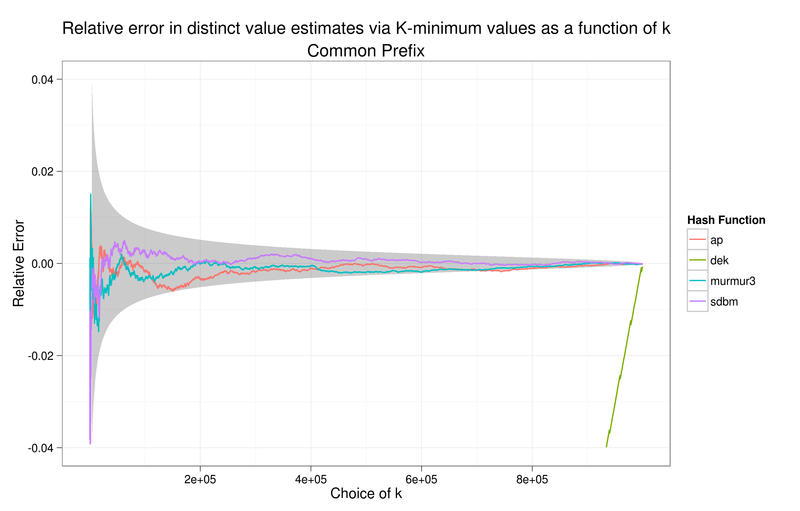 Suppose you have a stream of fixed sized, an ideal hash function, and from these you produce a distinct value estimate using the KMV algorithm. Now suppose that for some unlucky reason, one bit from your hash function is stuck; it’s always a zero or a one, but the other 31 bits are free of this curse. 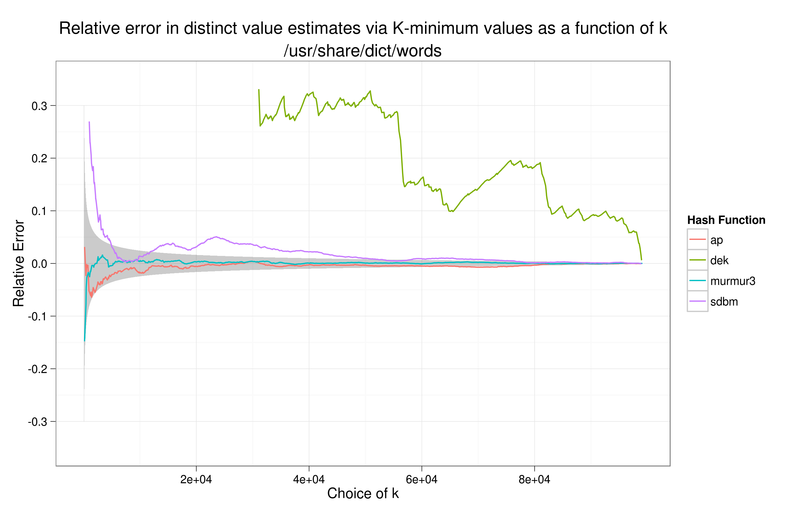 There’s nothing to stop you from computing a distinct value estimate using this janky hash with KMV, but your intuition suggests that it shouldn’t be very good. We went through this exact process with various choices of k, using a random number generator to simulate a perfect hash function. Before we look at the data, let’s think about what we should expect. From the perspective of KMV, it shouldn’t make a whole lot of difference if your kth smallest element is odd or even (for instance, in a case where the lowest order bit always/never set, respectively). It does, however, make a difference if you’re actually incapable of seeing values smaller than 231, which is what happens when the highest order bit is always set. 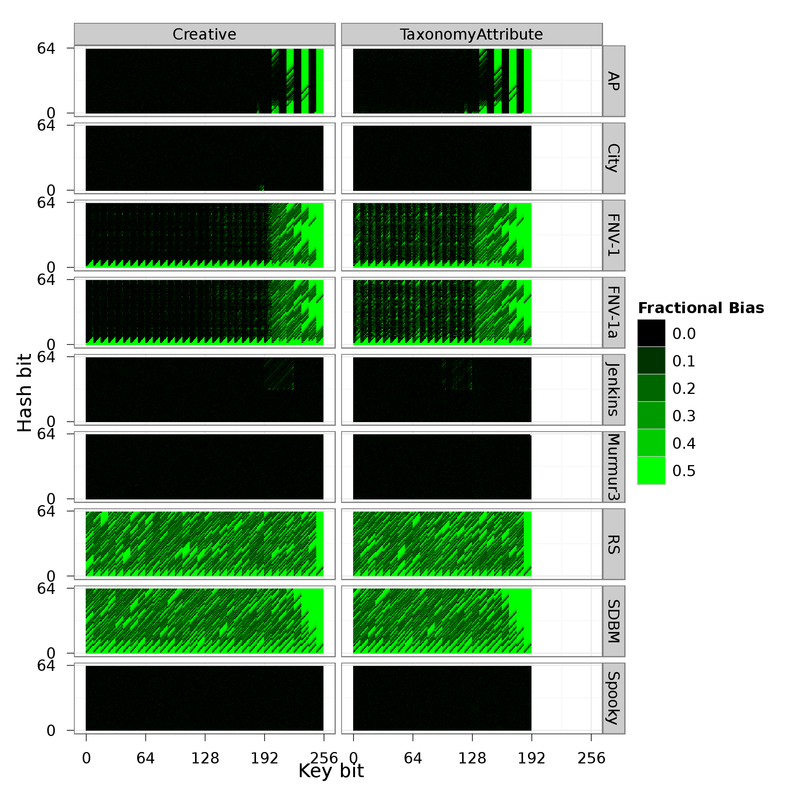 Thus, in both the 0-biasing and 1-biasing cases, we should expect that higher order bits have a much more dramatic effect on error than lower order bits. Notice how the performance degradation follows two different patterns. When we are fixing bits as ones, the observed error increases fairly smoothly, and tends to result in under estimates. In contrast, setting bits to zeros results in no change until the error increases producing catastrophic over estimates. Additionally, larger values of k have protective effects against these biases. Now that we have some intuition for the problem, let’s get a little more subtle. Instead of always setting the nth bit as a 0 or 1, let’s add a probabilistic element. We’ll do the same experiment as before, except we will now fix the nth bit with probability p. Thus, when p = 0 we have a perfectly well behaved KMV, and when p = 1, we have the experiment we just finished discussing. 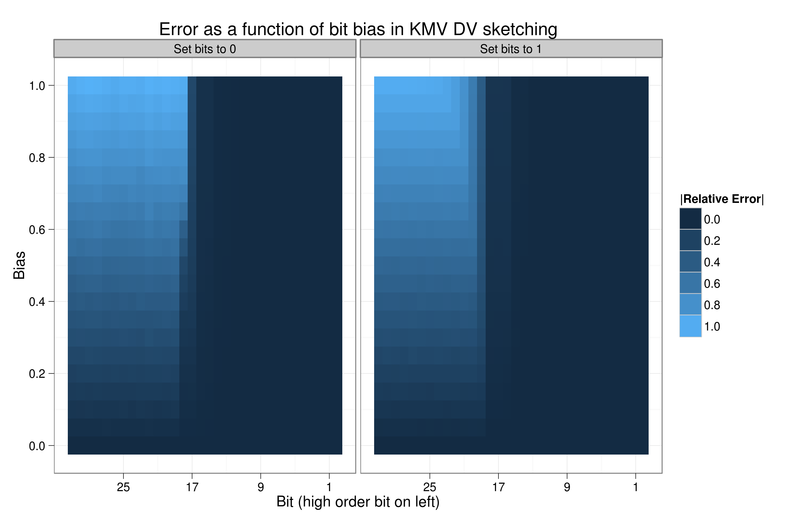 In the following diagram, each tile represents the average error across several experiments in which a stream of 1,000,000 unique elements was fed to a KMV sketch (k = 1024) which was rigged to modify the nth bit with probability p.
Many of the same lessons can be seen here — high order bits matter more, downward biasing degrades performance sharply, upward biasing degrades more smoothly. Additionally, as we’d expect, within a given bit, more bias means more error. 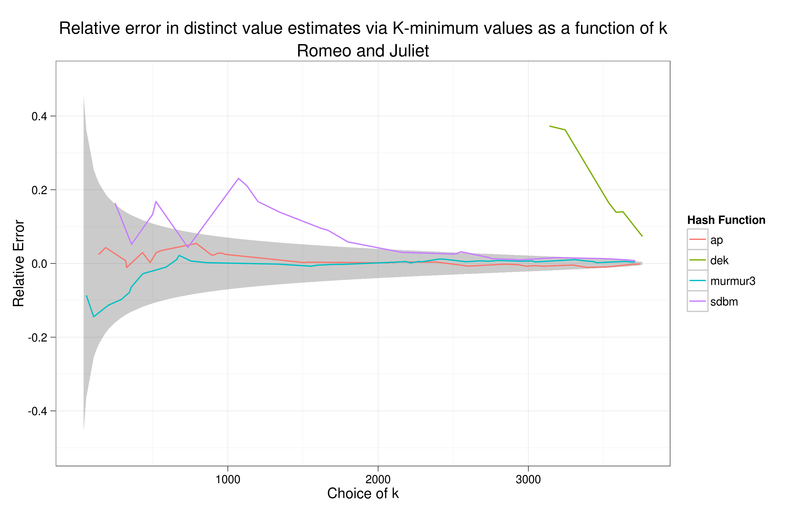 Using formulas from this paper, we can compute the relative error that 99% of KMV estimates should theoretically fall within. This turns out to depend on k and the stream size. To make these pictures, I chose random values of k within each hash/document pair at which I evaluate the cardinality estimate and compute the relative error. The lines are linear interpolations between sampled points and are shown solely for clarity. The y-axis scale is adjusted on a per-picture basis to best display the theoretical envelope within which we expect our errors to lie. Now that we’ve gotten through all the necessary preamble, let’s take a look at the results! One picture in and we’ve already learned a lesson: choice of hash function seriously matters! SDBM and DEK cause the algorithm to perform well below its capabilities. DEK’s error is actually off the charts for most of this graph, which is why it does not appear until k > 3,000. 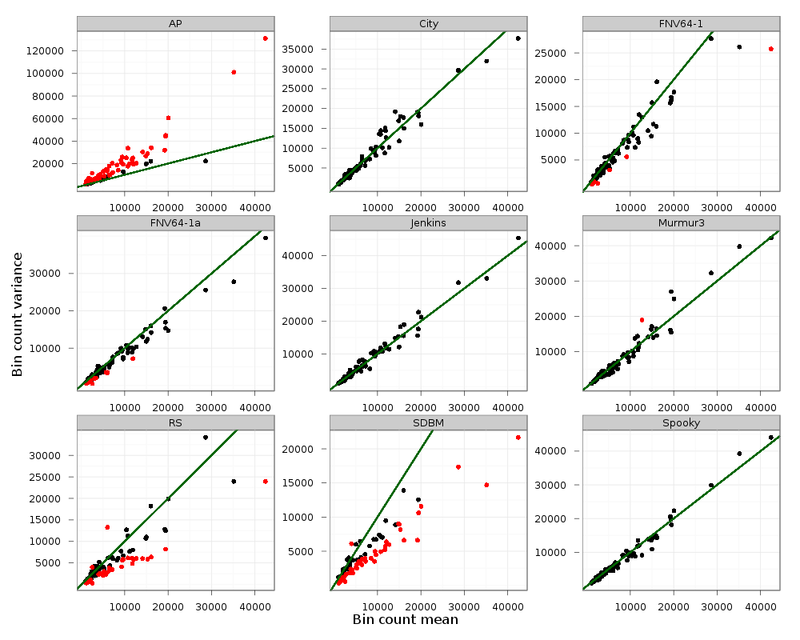 On a bigger corpus with tighter theoretical error bounds, Murmur3 and AP are still doing quite well. Do note, however, that AP dips outside the envelope for a while at k = 70,000 or so. With the random strings, SDBM performs much better than it did on English words. DEK, however, is still hopeless. It’s a little tough to see on these pictures, but at high k, AP starts to fall off the wagon, and even Murmur3 dips outside the envelope, though not beyond what we’d expect, statistically speaking. Honestly, I was hoping for some fireworks here, but they didn’t materialize. I was wondering if we might see some hashes break on one version of these strings, and do fine on the other due to the location of the varying key bits (high order/low order). Sadly, that didn’t happen, but a negative result is a result none the less. To summarize these, I made the following table, which shows us the percentage of time that an one of the samples falls outside the theoretical envelope. In this view, Murmur3’s superiority is clear. 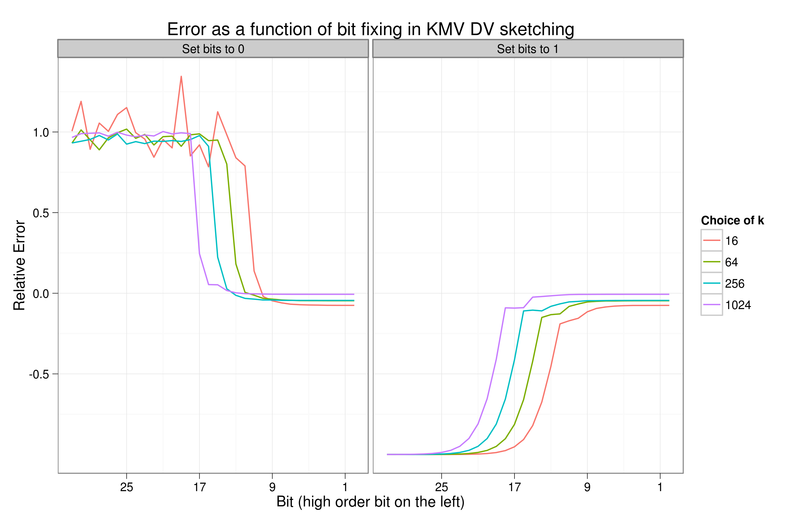 KMV is a very nice little algorithm that is incredibly simple to understand, implement, and use. That said, if you’re going to make use of it, you really do need to practice some due diligence when choosing your hash function. With packages like smhasher available, trying out multiple hash functions is a cinch, and a little legwork at the start of a project can save you from confusion and despair later on!